If we asked you to think of a CRM, there’s a high chance you’ll say Salesforce. They’ve dominated the space for years, especially for larger enterprise customers. But they’re not the only customer relationship management system out there. One of the best alternatives to Salesforce is HubSpot, with 56,500+ users in 100 countries. Rather than striving to fill a niche, HubSpot has won its uniqueness by providing customers with an all-in-one system with the company’s inbound marketing philosophy at its heart. When should a company use Salesforce or HubSpot? And how can you decide whether Salesforce or HubSpot is better for your business? If you’re deciding between Salesforce or HubSpot, you will likely have a mid-sized or established business that needs something more than most of the CRMs on the market for small businesses. If your business is still small, focus on HubSpot: it’s better for small businesses that might want to scale in future. If your business is midsize or growing fast, either HubSpot or Salesforce could be a good fit for you. Nearly all businesses can benefit from a good CRM system (the exception: if your business has almost no data about leads, customers or sales to store). 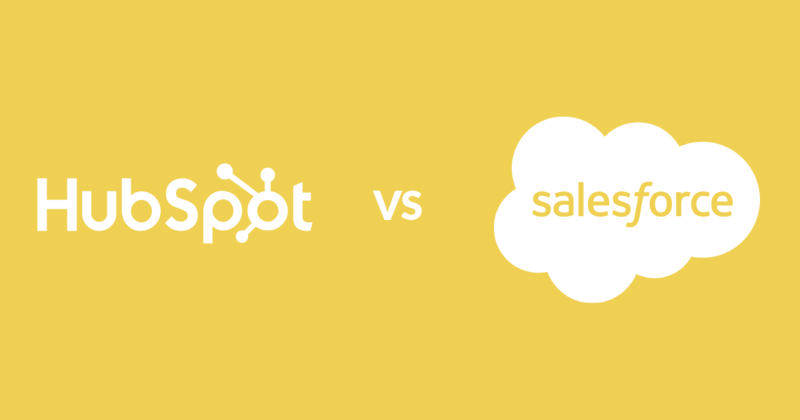 Here’s our comparison of two of the biggest players: HubSpot vs. Salesforce. HubSpot’s basic CRM is famously free, and you can choose which of their Sales, Marketing, and Service Hubs to add on top. Their basic Starter plans are $50/month for each Hub you need. After this, prices rise steeply: it’s $800/month for the Professional plan for Marketing, and $400/month for Sales or Service (billed annually). If you need their Enterprise features, your business should be at a stage where you can stomach another steep price jump. See HubSpot pricing here. How expensive is Salesforce? The short answer: expensive. Although they have a $25/user/month Essentials plan, this isn’t going to get you far. Like HubSpot, their basic plan for their Sales Cloud (the core CRM) is a “land and expand” tactic. To get the functionality you need, you’re likely to soon see yourself paying $150/user/month for their Lightning Enterprise plan for the Sales Cloud. For their Marketing Cloud, Service Cloud, and other automation and integration features, you’ll need to add these separately to your package. See Salesforce pricing here. The verdict? If you’re on a tight budget or concerned about cost, Salesforce isn’t right for you. HubSpot has big price jumps between plans, but it’s still a fraction of Salesforce. In May 2018, Salesforce was named the #1 CRM for the fifth consecutive year according to IDC data. That should be taken with a pinch of salt – although Salesforce is the king of CRMs, it’s not for all businesses. Salesforce deserves its reputation as a sterling CRM for enterprise-level businesses. In terms of functionality, Salesforce is better than HubSpot as a CRM. But not all businesses need all of the features, complexity, and level of customization that Salesforce offers. 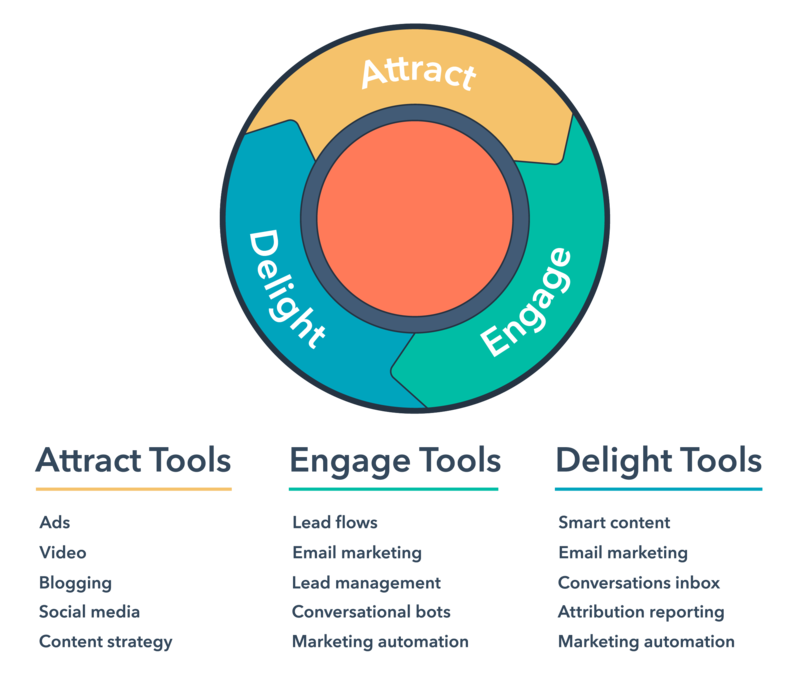 HubSpot tries to tick a lot of boxes, and the system provides tools for social media marketing, content management, web analytics, landing pages and search engine optimization. That’s a lot in one place. HubSpot does it well, however, and its customers have a tool that can grow with their business and fill gaps when and if they need them. HubSpot coined the inbound marketing methodology, a technique for drawing customers to products and services via content marketing, SEO and branding. This philosophy infuses HubSpot’s own product and services. If your business also has a heavy focus on content marketing, HubSpot may well be a good fit for you – both in terms of product and ethos. The verdict? In terms of functionality, Salesforce is better than HubSpot as a CRM. But there are many businesses that don’t need anywhere near all the features that Salesforce offers. Also, if you’re a business with a focus on content marketing or need a strong link between sales and marketing, try HubSpot. Automation is playing a more important role in businesses than ever before. It’s never been easier to let your tools work for you, especially when it comes to your CRM system. 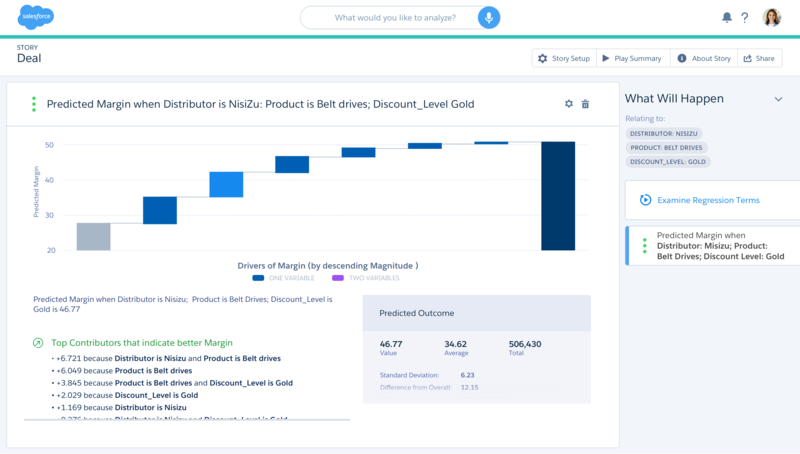 Salesforce has Einstein, its own built-in artificial intelligence to help you work more intelligently. With the add-on, you can set up completely automated processes to take contacts from new lead to onboarded customer and beyond. According to their 2018 report, Salesforce Einstein now generates more than 1 billion predictions a day for their customers. HubSpot has a comprehensive feature set for automation, including workflows that you can build around any contact, company, deal and ticket values (although the latter two still have some teething issues). If you want to create internal or customer-facing “if this, then that” actions, HubSpot has your back. Some automation features are gated behind their Enterprise plan, including predictive lead scoring, recurring revenue tracking, and custom event triggers. The verdict? HubSpot offers more than enough automation for most mid-sized businesses. As with most features offered by both tools, if you need enterprise-level standard you will probably be more impressed by Salesforce. If you’re a mid-sized to enterprise level business, reporting and analytics will matter to you. Analytics isn’t HubSpot’s strong suit, and larger teams may find themselves asking how accurate the data it gives you really is. Their Reporting add-on fills some of the gaps, allowing you to create dashboards of any and all properties you want to track against each other. The verdict? Salesforce wins on reporting and analytics. One of the main benefits of integrating Salesforce and HubSpot would be to improve the accuracy of your data, but this is likely a costly way of doing things. Salesforce and HubSpot aren’t tools to be used in a silo. When you place them at the centre of your business and ensure that everyone knows how to use them, you’ll get the most results. Both HubSpot and Salesforce have the functionality for sales, marketing and support teams, and you can layer their features and plans to create the mix you need. Right now, HubSpot offers the most user-friendly sync between sales and marketing departments. Their Support Hub still has a lot of room to grow, so you might still be better served integrating a more comprehensive tool like Intercom for your support tickets, however. The verdict? HubSpot provides an easy gateway to getting your sales and marketing teams on the same page. It’s not quite there for support yet, unless you’re a smaller business. You need to know that your CRM can grow with you. That’s one of the best things about the HubSpot CRM system: you can start with a completely free plan, and upgrade as and when your business grows, in the specific areas where you need more functionality. Most users are unlikely to hit many ceilings if you’re willing to pay for top-tier enterprise functionality. Some specific use cases may eventually run into a few issues if you’re in need of high levels of customization. With Salesforce, there is no end to the potential to scale and customize the software for your business. It’s designed for huge companies that have a long list of niche requests, including current known requirements and unknown future needs. The verdict: both tools will grow with you, but the sky’s the limit with Salesforce. You can get signed up for the HubSpot free CRM in a matter of minutes. Without needing a paid plan, you can import all of your contacts as a CSV, match their existing fields to standard and existing HubSpot properties (e.g. lifecycle stage, deal won date, renewal date, account manager) and start organizing your pipeline. Salesforce offers a 14-day free trial, but it’s just that: a trial. Eventually you’ll need to decide if you can pay up for a paid plan. With HubSpot, you’ll always have the free CRM. With Salesforce, you’re also likely to require an in-house Salesforce specialist or time with one of their experts. Anyone has access to HubSpot’s wealth of free content resources, and they also have the comprehensive HubSpot Academy to improve your business know-how. Salesforce has the comparative Trailhead e-learning hub, but with HubSpot’s inbound marketing ethos, it’s not surprising that they win on content. As a HubSpot paid customer, you’ll have access to their 24/7 phone support and support tickets with email responses. They also offer live chat, which is often unavailable at the time of writing. But on the whole, your problems will be listened to and solved by HubSpot. Each Salesforce plan includes a Standard support package, with 2-day response time to your inquiries. For critical response times, you’ll need to pay extra for their Premier plan or above. You can see all Salesforce support plans here. The verdict? Despite their sporadic live chat availability, HubSpot wins on support, unless you’re a top-tier enterprise client. Most businesses are using a multitude of different tools and services, which can lead to scattered data and productivity loss if you don’t have integrations in place. This is especially the case when it comes to your CRM, where the bulk of your data is held. Fortunately, both HubSpot and Salesforce have a great range of integrations. HubSpot Integrations Library has 270 out-of-the-box integrations that are simple to set up with the other apps you use often, like Jira, MailChimp, or Slack. Salesforce AppExchange has 172 apps, 103 of which are paid. You can also hire developers to help you create custom integrations, but there are easier options. PieSync offers integrations between HubSpot, Salesforce and 160+ apps, and uses a 2-way contact sync to keep your data updated in real-time. This makes integrating your tools much easier than you might think. The verdict? HubSpot is our winner here, with the highest number of out-of-the-box integrations. For either CRM, PieSync makes streamlining your workflows much easier via 2-way contact syncs between your business tools. As of March 2019, HubSpot has 56,500 users in 100 countries (according to their homepage). Salesforce, in comparison, has over 150,000 customers according to their 2018 Annual Report, with an estimated 25 subscribers (or individual users) per customer. On Capterra in March 2019, HubSpot had a 4.5/5 rating for their CRM based on 1758 reviews. HubSpot Marketing also has a 4.5/5 rating, this time based on 3242 opinions. Salesforce, unsurprisingly, wins on the sheer number of reviews: 10,626 with a 4.5/5 average rating. The verdict? Salesforce still wins by a mile on adoption and market share. In terms of reviews, we’ll call it a draw. So, when should you choose Salesforce or HubSpot as your CRM? As a rule of thumb, if you want to stay lean, choose HubSpot. Choose Salesforce if you need a customizable CRM solution, or will in future. If you’re worried about cost, Salesforce probably isn’t for you. If you need tip-top reporting and analytics, look closer at Salesforce than HubSpot. Can HubSpot replace Salesforce? In some cases, definitely. If your business wants to stay lean but still have a lot of scope to grow, we’re more likely to recommend HubSpot than Salesforce to you. For some businesses, you might even want to use both HubSpot and Salesforce and set-up the integration between the two tools. I thought HubSpot and Salesforce were competitors? In many ways, yes. But some businesses can benefit from using both tools in their organization for different yet complementary purposes. One Capterra review explains: “HubSpot integrates with our Salesforce CRM, and provides valuable information to our sales staff, which can help them better help our customers/potential customers. We assign leads that come through HubSpot and feed into Salesforce for personal follow-up…” Another review mentioned integrating their Salesforce API for accurate lead scoring. For most businesses, however, it’s going to be a choice between HubSpot and Salesforce. Migrating CRMs isn’t easy, so aim to choose a system that can cover you for the long term. Think about your plans for the next few years and if HubSpot or Salesforce can tick those boxes. Then, make use of the free trials available and assess the features that are really important to your business. Lucy Fuggle writes for PieSync, the two-way contact sync tool for hundreds of apps. She also works with her clients to make their brand matter with a content-rich marketing strategy.